The Boeing 747SP is a widebody commercial jet airliner developed by Boeing Airplane Company. It is a highly-modified version of its predecessor, the Boeing 747-100 with SP standing for "special performance". Known during development as the short-body 747SB, the weight saved by the shortened fuselage permits longer range and increased speed relative to other 747 configurations. The idea for the 747SP came from a request by Pan Am for a 747 variant capable of carrying a full payload non-stop on its longest route between New York and Tokyo. Joined with Pan Am's request was Iran Air; their joint interest was for a high capacity airliner capable of covering Pan Am's New York-Middle Eastern routes and Iran Air's planned Tehran-New York route which, when launched at the time, was the longest non-stop commercial flight in the world. The aircraft was launched with Pan Am's first order in 1973, and the first example delivered in 1976. A shorter derivative of the 747-100, the SP was developed to target two market requirements. The first was a need to compete with the DC-10 and L-1011 while maintaining commonality with the 747, which in its standard form was too large for many routes. Boeing lacked a mid-sized widebody to compete in this segment. The second market requirement was an aircraft suitable for the ultra-long-range routes emerging in the mid-1970s following the joint request. These routes needed not only longer range, but also higher cruising speeds. Boeing could not afford to develop an all-new design, instead opting to shorten the 747 and optimize it for speed and range, at the expense of capacity. Apart from having a significantly shorter fuselage and one fewer cabin door per side, the 747SP differs from other 747 variants in having simplified flaps and a taller vertical tail to counteract the decrease in yaw moment-arm from the shortened fuselage. The 747SP uses single-piece flaps on the trailing edges, rather than the smaller triple-slotted flaps of standard 747s. The SP was also the first and - until the introduction of the Boeing 777-200LR - the only Boeing widebody with a wingspan greater than the length of the fuselage. The SP could accommodate 230 passengers in a 3-class cabin or 331 in a (303 economy, 28 business) 2-class cabin, and a maximum of 440 passengers in one class. Originally designated 747SB for "short body", it later was nicknamed "Sutter's balloon" by employees after 747 chief engineer Joe Sutter. Boeing later changed the production designation to 747SP for "special performance", reflecting the aircraft's longer range and faster cruise speed. Pan Am was the launch customer for the 747SP, taking the first delivery, Clipper Freedom, on March 5, 1976, followed by Iran Air. Picture - 747SP prior to conversion into the SOFIA astronomical observatory in 1997. Note former United Airlines livery. The 747SP was the longest-range airliner available until the 747-400 entered service in 1989. Despite its technical achievements, the SP never sold as well as Boeing hoped. Increased fuel prices in the mid 1970s to early 1980s, the SP's heavy wings, expensive cost, reduced capacity, and the increased ranges of forthcoming airliners were some of the many factors that contributed to its low sales. Only 45 were built and of those remaining, most are used by operators in the Middle East. However, some of the engineering work on the 747SP was reused with the development of the 747-300 and 747-400. In the 747SP, the upper deck begins over the section of fuselage that contains the wingbox, not ahead of the wingbox as is the case with the 747-100 and 747-200. This same design was used in the 747-300 and 747-400 resulting in a stretched upper deck. Production of the 747SP ran from 1976 to 1983. 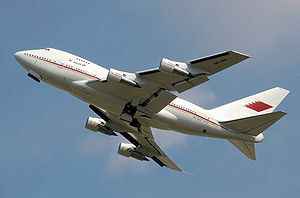 However a VIP order for the Royal Flight of Abu Dhabi led Boeing to produce one last SP in 1987. A special 747SP is the Stratospheric Observatory for Infrared Astronomy (SOFIA) astronomical observatory, which has its airframe modified to carry a 2.5-meter-diameter reflecting telescope to high altitude, above 99.9% of the light-absorbing water vapor in the atmosphere. The telescope and its detectors cover a wide wavelength range from the near infrared to the sub-milimeter region; no window material is transparent over this whole range, so the observations are made through a 13 ft (3.96 m) square hole in the port upper quarter of the rear fuselage, aft of a new pressure bulkhead. A sliding door covers the aperture when the telescope is not in use. Astronomers take data and control the instrument from within the normally pressurised cabin. Originally delivered to Pan Am and titled "Clipper Lindbergh", NASA has the name displayed in Pan Am script on the plane. Forty-five 747SP aircraft were built between 1974 and 1989. As of December 2008, 17 are still flying, 16 have been scrapped, and 12 are in storage, awaiting salvage or on display in museums. The following organizations operate the remaining airworthy 747SP airframes. Picture - A 747SP-27 during maintenance. Launch customer Pan Am took delivery of ten 747SP-21 aircraft between 1976 and 1979, operating them on trans-Pacific routes to Asia (Tokyo, Hong Kong, Bangkok, Singapore) and Oceania (Sydney, Melbourne, Auckland) as well as nonstop New York-Bahrain service. The aircraft and routes were sold to United Airlines in 1986, and remained in operation until 1994, where they were used on United flights to London, Rio de Janeiro and Sx�o Paulo. Iran Air took delivery of four 747SP-86 aircraft between 1976 and 1978. Prior to the 1979 Islamic revolution, the aircraft were used on the daily Tehran-New York flight, at the time the longest non-stop airline route in the world. All of them are still in service. TWA operated three 747SP-31 aircraft from 1979 to 1986. These aircraft were intended for long distance routes to the Middle East which never materialized. Instead, they flew on regular red-eye flights between Los Angeles and Boston, as well as international flights to Paris. Two of these were purchased by American Airlines (see below); the third was purchased by the government of the United Arab Emirates and later by Las Vegas Sands. Qantas operated two 747SP-38 aircraft from 1980 to 2004. These aircraft were used for flights between Australia and Wellington, due to Wellington's short runway but still able to meet passenger number requirements, as well as service from Sydney to Nagoya, stopping in Cairns, and transpacific service between Sydney and Los Angeles. They were equipped with Rolls-Royce engines, unlike most other 747SPs. Braniff took delivery of 3 747SPs for their ultra-long haul routes in the Pacific. They were fitted with 300 seats in a luxurious cabin and an all-orange exterior. Of the three planes, as of August 2006, one has been scrapped and one is in VIP service with Yemen government. The third was formerly in VIP service with the Oman government, but was recently sold to the owners of Fry's Electronics, sometimes used to carry tours of Ballet San Jose. CAAC (now Air China) used the type to open its first route to USA: Beijing - Seattle. Later, the type was also used for service to Vancouver and New York from Beijing. Korean Air operated the type on routes from Seoul to various destinations in USA and Europe. Mandarin Airlines operated the 747SP aircraft on routes from Taipei to Australia in the mid-1990s. American Airlines purchased two used airframes from TWA (N601AA and N602AA) in the late 1980s to begin their Dallas to Tokyo service. These aircraft were later moved to serve New York to London and New York to Brussels routes while AA awaited the deliveries of additional MD-11s. One of the aircraft was sold to Kazakhstan Airlines and later scrapped, while the other was sold to the government of the United Arab Emirates and then to evangelist Ernest Angley. Saudi Arabian Airlines In 1981 Saudia received the first of two 747SP. One year later the airline received its second 747SP. On July 1, 1981, the first nonstop service was inaugurated from Jeddah to New York with the airline's very own Boeing B747-SP aircrafts. This service, along with the Riyadh-New York service introduced later. Liberty Bell Express-Flown from New York/JFK May 1-May 3, 1976. 2 stopovers at Indira Gandhi International Airport, New Delhi and Tokyo-Haneda Airport. The round-the-world flight took 46 hours and 26 minutes over 23,137 miles. Pan Am Flight 50-to celebrate the 50th anniversary of Pan Am. Flown 28-30 October 1977 from San Francisco/SFO, with a time duration of 54 hours, 7 minutes, 12 seconds. 3 stopovers at London-Heathrow Airport, Cape Town International Airport and Auckland Airport. Flight 50 flew over both the North Pole and the South Pole. Friendship One-Flown 29-31 January 1988 from Seattle/SEA, to raise funds for Friendship Foundation. Two stopovers were made, at Athens Airport and Taipei-Taiwan Taoyuan International Airport, (formerly the Chiang Kai-shek International Airport). The record lasted less than a month, as it was beaten by a Gulfstream IV piloted in part by Gulfstream Aerospace CEO Al Paulson. The round-the-world flight took 35 hours and 54 minutes over 23,125 miles. On February 19, 1985, China Airlines Flight 006, a 747SP-09 (aircraft registration N4522V) with 274 passengers and crew onboard on a flight from Chiang Kai-shek Airport to Los Angeles International Airport suffered an inflight failure on engine number four. While the flight crew attempted to restore power the aircraft rolled to the right and started a steep descent from the cruising altitude of 41,000 feet, accelerating to 4.8 G and 5.1 G on two occasions. The captain managed to stabilize the aircraft at 9,500 feet and the aircraft diverted to San Francisco International Airport which was 550 km (343.8 mi.) away. Two passengers were injured and the aircraft suffered major structural damage. On 5 October 1998 a South African Airways Boeing 747SP-44 (ZS-SPF) operated by Linhas A�reas de Mozambique suffered engine failure. Shortly after Take-off from Maputo International Airport, Mozambique the no. 3 (Pratt & Whitney JT9D-7FW) suffered an uncontained failure. Flying debris caused damage to the no. 4 engine and the wing. A fire erupted, but couldn’t be extinguished immediately. An emergency landing was carried out. All 66 people on board survived. The aircraft was later scrapped. Jenkins, Dennis R. Boeing 747-100/200/300/SP (AirlinerTech Series, Vol. 6). Specialty Press, 2000. ISBN 1580070264.